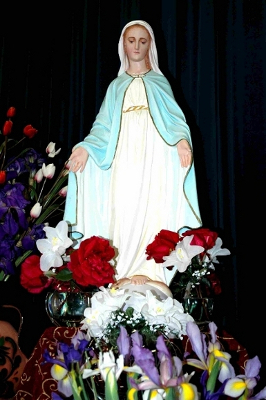 This Website is dedicated with love to Our Lady of the Rosary. This title "of the Rosary" is one of her many titles, one of the most famous and well known, and yet its origins are shrouded in mystery. Our Lady's Rosary Makers, in Australia and New Zealand, and in USA where it all started in 1949, and in the 35 countries throughout the world where Rosary Makers live and work are people who understand the importance of Mary's many messages, particularly at Fatima (Portugal) in 1917, and want to do something about it. Though all Catholics and most other religions would be familiar with the term`Our Lady' and know that it refers to Mary, the Mother of Jesus, also known as the Blessed Virgin Mary, the term may not be universally recognised in non-English speaking countries, so it is defined here. That is who she is in relation to us! "I am your merciful mother, the merciful mother of all of you who live united in this land, of all mankind, of all those who love me, of those who cry out to me, of those who seek me, and of those who have confidence in me." So that is who she is in relation to you and me.